In custody battle, Alex Jones is claiming to be a "performance artist"
Kelly Jones, ex-wife of Infowars lunatic Alex Jones, is in a custody battle over their three children. She says Alex is "not a stable person." "He says he wants to break Alec Baldwin's neck," says Kelly Jones. "He wants J-Lo to get raped. I'm concerned that he is engaged in felonious behavior, threatening a member of Congress … He broadcasts from home. The children are there, watching him broadcast." Calm down, said Randall Wilhite, Alex Jones' attorney at a pretrial hearing. "He's playing a character. He is a performance artist." 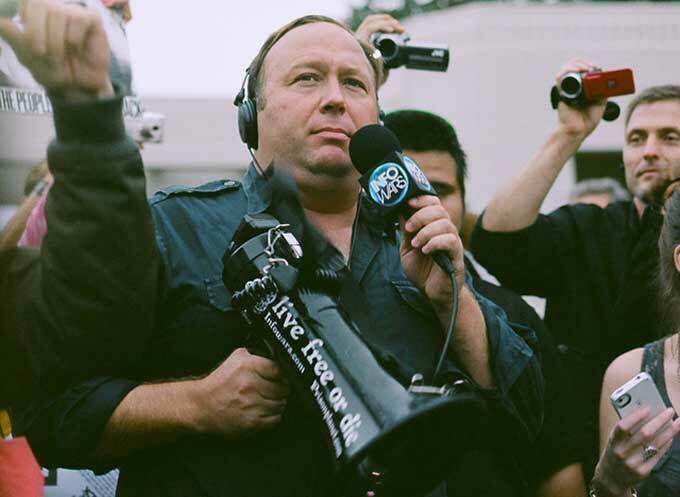 The Jones' children have lived with Alex Jones since the couple divorced in 2015. In a July 2015 broadcast, Jones brought his then 12-year-old son onto the show: "He is undoubtedly cut out for this, and I intend for him to eclipse what I've done," Jones said at the time. "He's a way greater person than I was at 12. I love you so much, and I didn't mean to get you up here, sweetheart, and tell people how much I love you, but you're so handsome, and you're a good little knight who's going to grow up, I know, to be a great fighter against the enemy." Here we see a drone operator pestering a man who appears frightened and confused. It’s a shame the man didn’t have a shotgun to take care of the pesky flying contraption. He attended the bull run for thrills, and got his money’s worth. So why are you buying the lottery today?